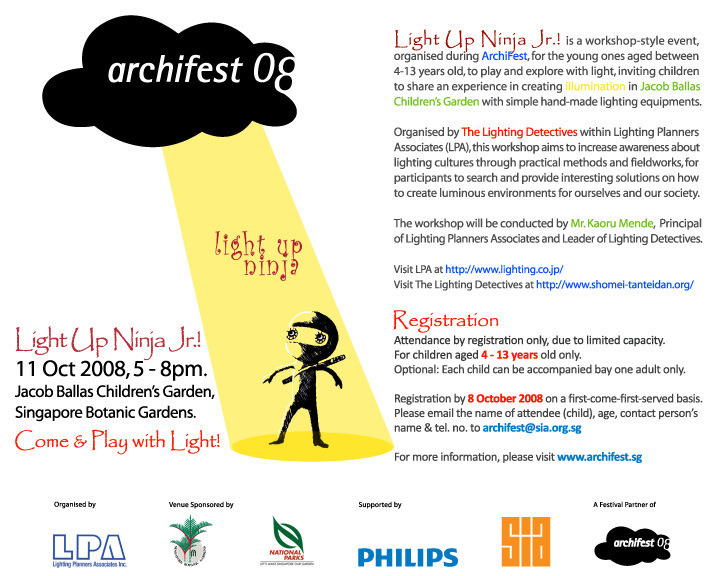 In conjunction with ‘Archifest 08’ event sponsored by the Singapore Institute of Architects (SIA), the Lighting Detective Singapore Chapter held a new version of an old event, “Light Up Ninja Junior.” The last Light Up Ninja event was three years previous, but this Junior event is tailored towards children. We didn`t really know what to expect for young Lighting Detectives, but we did our best to prepare! This was the first ever Lighting Detectives workshop tailored towards children, and if all goes smoothly, maybe a platform for other events to come. The first challenge was to agree upon a venue. Out of many possibilities, and with support from NParks, the Jacob Ballas Children`s Garden inside the Singapore Botanic Gardens was chosen. 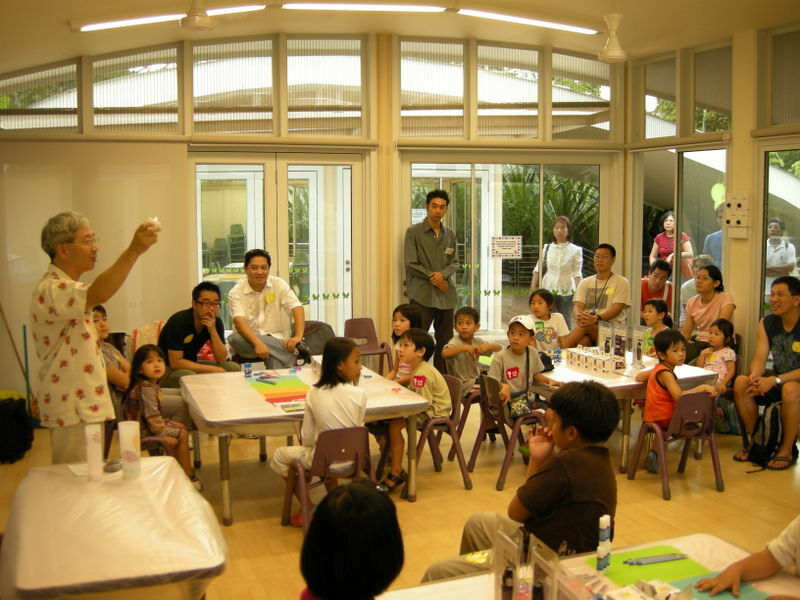 Next, what kind of lighting event would be most intriguing for 30 children ages 4 to 10 years old? We tried to prepare an interesting, but simple event that would make light fun. 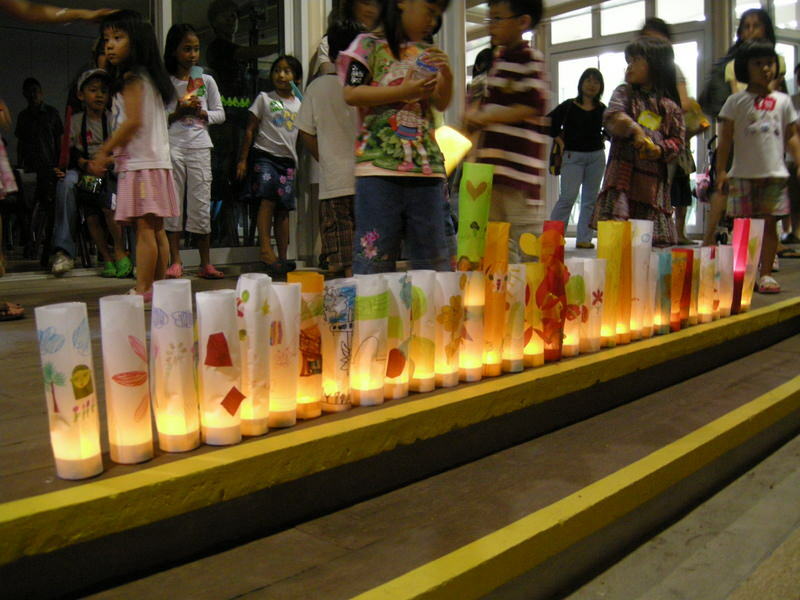 The event came to center on hand-made lanterns by the children. After completion, the lanterns would be set around the garden for the children to experience the softly growing light in a dark environment. We also planned to use flashlights to light up different trees on a night stroll through the garden. Planning is a good thing, but just that, a plan. Clear and sunny for the 5 o`clock start of Light Up Ninja Junior! 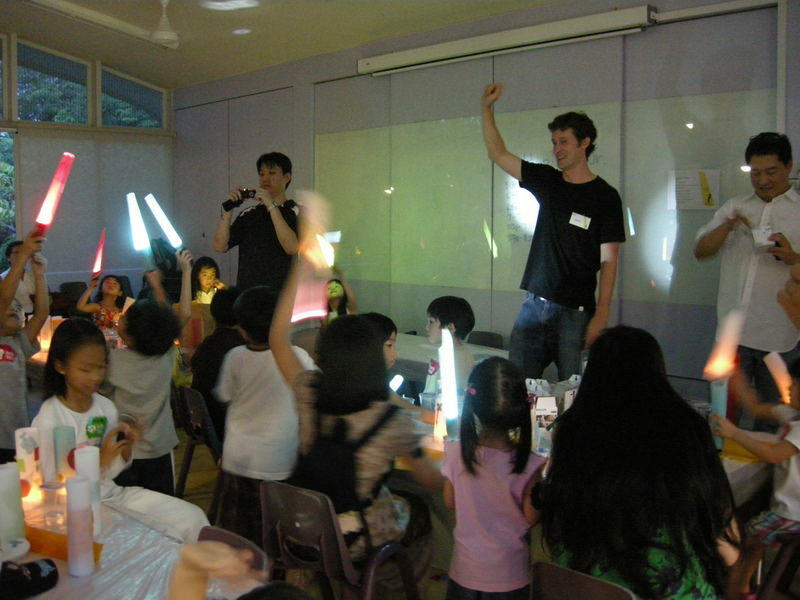 All children just fall in love with Lighting Detective, Brian, so he was leader of today`s event. SIA council members and architects also agreed to be team leaders for the event. Chief Mende opened the workshop with a few words and then the children dug into the crayons, sissors, and paper to create one-of-a-kind lanterns. 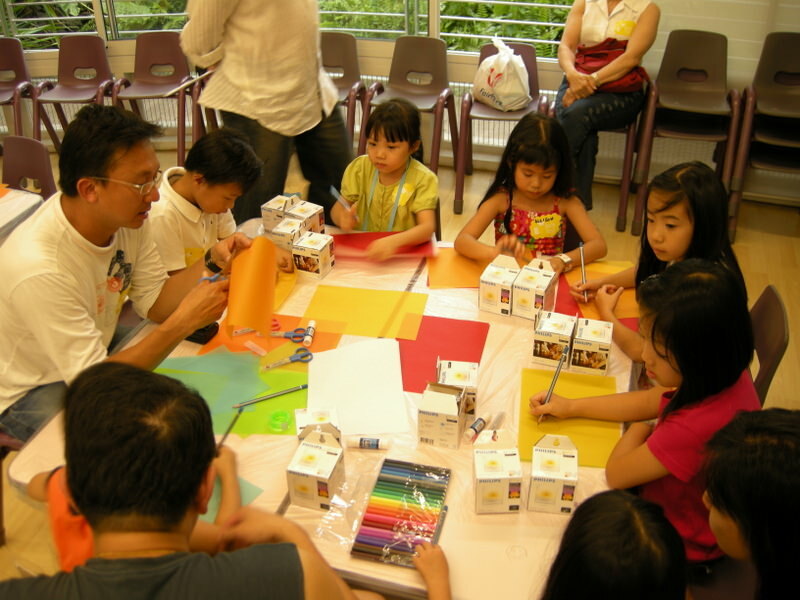 First, using different colored markers, the children drew pictures, patterns, or designs on tracing paper. The paper was then cut and fashioned around a LED candle. The children very nervous and shy at the start, loosened up and became immersed in their drawings and lanterns. Tracing paper was also wrapped around the flashlights for a light saber. The children seemed to like this the best and ran around shining the light sabers on evil darkness. Their energy was infectious with team leaders and Chief Mende joining the fun!! Never forget your inner child! Dusk was setting in on the garden. Children, lanterns, and light sabers all moved outside to the garden for a night parade. But, out in the garden spying on the children was the Light Up Ninja!! 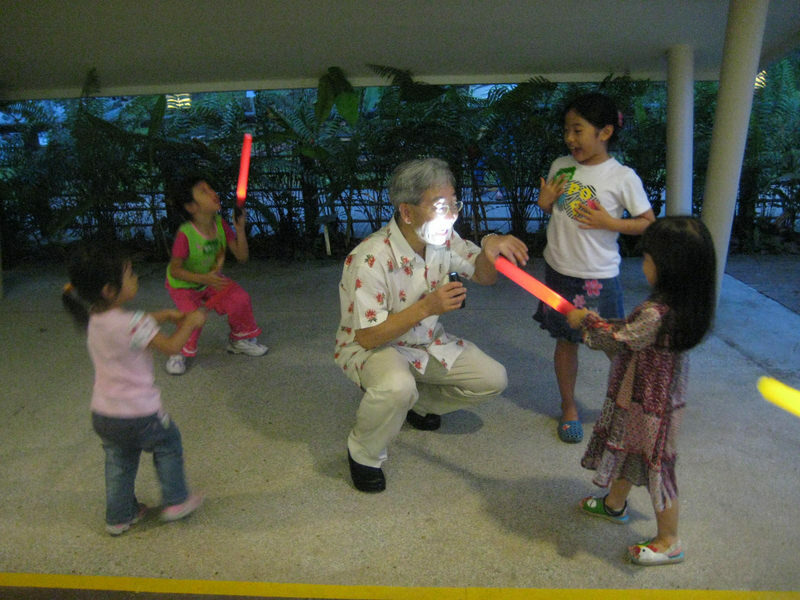 After the children realized that the Ninja doesn`t like light, they chased him around. 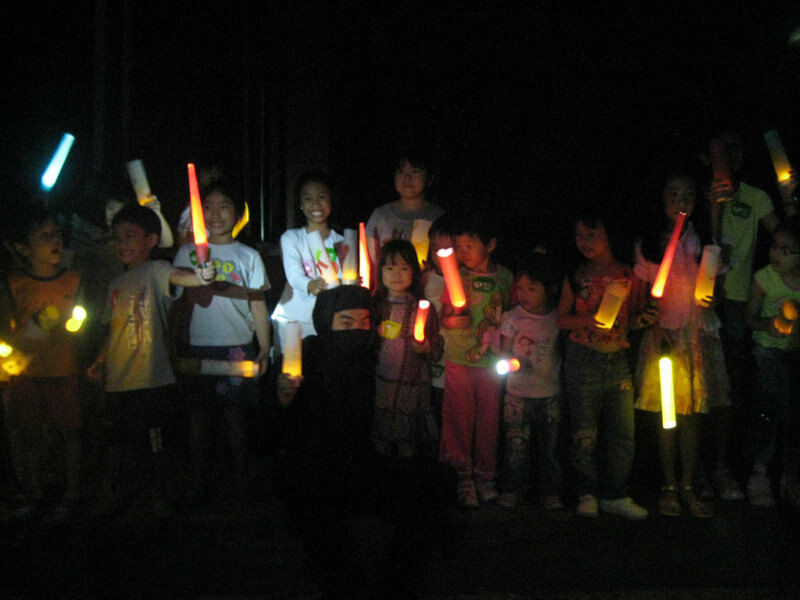 The ninja tried the run and hide when the children shone their lanterns and light sabers in his direction. An impromptu night version of hide-and-seek was great fun for the children and ninja.